According to archeological records from around the world, the hunting knife is one of Man’s oldest cutting tools. However, as useful as a hunting knife is, there are certain situations in which even the largest hunting knife is simply not large enough. But, it was not until Man progressed from the Bronze Age to the Iron Age that making long cutting tools such as machetes became a practical endeavor. However, it was the discovery of the process for making steel that enabled the production of long, thin, cutting tools to become truly practical and thus, since then, the concept of a long, thin, cutting tool has proliferated around the world. Consequently, there are now many such tools that are associated with particular ethnic groups and which are designed to perform specific cutting tasks. In fact, the word “machete” is actually a Spanish term that originated in South America and denotes a tool that was specifically designed for cutting the soft plants found in the Amazon jungle. But, there are many other such tools which all have very distinct blade designs that originated in other parts of the world such as the East African Panga, the Malaysian Prang, the Philippine Barong, and the Indonesian Golok. In addition, although all of these tools are commonly referred to as “machetes“, the fact is that they can generally be divided into two categories consisting of those with thin, lightweight, blade designs which are meant for cutting soft vegetation and, those with much thicker blades which are meant for cutting tough woods. Therefore, when choosing a modern machete, it is important that you first determine what your main purpose for your tool will be so that you can choose the best machete blade design to meet your needs. Therefore, when choosing a modern machete, there are three key features to that you need to consider consisting of blade design, blade length and, the thickness of the blade because each parameter affects the way in which the machete performs. 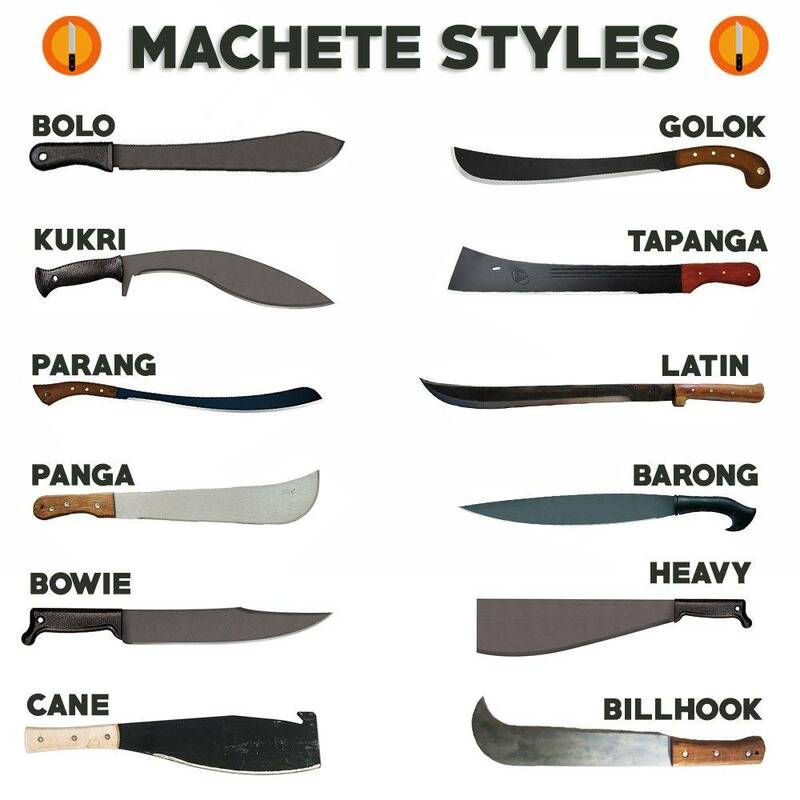 The different Machete styles you can find. Next, in addition to the type of blade design you choose, you should also be aware that machetes are available in a wide range of blade lengths from as short as 12 inches to as long as 24 inches or more. 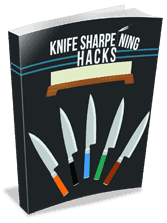 Therefore, in addition to the proper blade design for your intended purpose, you will also need to choose the best blade length. For instance, machetes with short blades are specifically designed to provide the user with a greater degree of control over the blade but, due to their short moment arm, they have very little momentum when swung and thus, they do not bite very deeply. However, machetes with long blades are specifically designed to provide much greater momentum when swung and thus, they bite far more deeply than those with short blades but, provide less control over the blade. Last, it should be noted that machetes can also be classified according to the thickness of their blades. For instance, the very large majority of machetes have relatively thin blades that measure approximately 1/8 inch in thickness which makes them relatively lightweight and thus, easy for most users to control while still providing enough momentum to allow them to easily cut through soft vegetation. But, the control provided by such thin blades also makes them vulnerable to breaking when used to cut tough, woody, plants such as vines, small tree limbs and, saplings. Thus, there are other machetes such as the Camp 18 and Camp 14 by Kershaw, the Grass Machete by KA-BAR and, the Brush Demon by Outdoor Edge, that feature much thicker blades measuring up to 1/4 inch in thickness which are specifically designed for heavy duty chopping tasks. But, at the same time, machetes with such thick blades are much heavier than their counterparts and thus, while they are much stronger than machetes with thinner blades, they also bite less deeply and are more difficult to control. Based on the classic, South American concept of a lightweight machete, the Ontario Knife Company Military Machete is one of the most well known and most popular machete designs on the market today. In fact, OKC has been manufacturing this very design for the U.S. Military for over 70 years. Featuring a blade made from high carbon Plain Tool Steel with a straight back, a plain cutting edge and, a deep belly, it also has a zinc-phosphate coating to help prevent corrosion and a very comfortable molded plastic handle. In addition, although not included with the machete, OKC does offer a heavy duty nylon packcloth sheath with a heavy duty liner. Plus, it is also available in both 12 and 22 inch lengths. Based on the Philippine Barong, the Cold Steel Barong Machete is a classic, ethnic, machete design that features a beautifully curved leaf-shaped blade that measures 18 inches in length with a Drop Point and a plain cutting edge made from 1055 high carbon Plain Tool Steel. In addition, it also features a classic Barong-style handle made from polypropylene and includes a heavy duty Cor-Ex nylon sheath. For those of you who are in need of a truly heavy duty machete for cutting tough plants, the Kershaw Camp 18 is hard to beat! Featuring a heavy duty, 18 inch, Drop Point blade design blade made from 65 Mn high carbon Plain Tool Steel with a plain cutting edge and a positive rake angle with a black powder coat to help prevent corrosion, this is one tough machete! In addition, it also features a Hidden Tang and one of the most ergonomic handles ever designed. Plus, the handle is coated with deeply checkered Thermo Plastic Rubber for an extra secure grip and, it includes a molded Kydex sheath. Based on the Borneo Dayak Parang Changdong knife design, the Condor Knife & Tool Parang Machete is an ethnic design that features a very graceful, weight forward, Drop Point blade design that measures 17 1/2 inches in length made from 1075 high carbon Plain Tool Steel with a black powder coat finish to help prevent corrosion. In addition, it also features a classic Parang handle design made from walnut and includes a heavy duty leather sheath. Another classic, ethnic, machete design, the Golok Machete made by Condor Knife and Tool features very graceful, weight forward, Trailing Point blade design that measures 14 inches in length made from 1075 high carbon Plain Tool Steel with a black powder coat finish to help prevent corrosion. In addition, it also features a classic Golok handle design made from walnut and includes a heavy duty leather sheath. A bit shorter than the Camp 18 listed above, the Kershaw Camp 14 machete provides a little more control but, is still a heavy duty machete for cutting tough, woody, plants. Featuring a heavy duty, 14 inch, Drop Point blade design blade made from 65 Mn high carbon Plain Tool Steel with a plain cutting edge and a positive rake angle with a black powder coat to help prevent corrosion, this is one tough machete! In addition, it also features a Hidden Tang and a super comfortable handle design. Plus, the handle is coated with deeply checkered Thermo Plastic Rubber for an extra secure grip and, it includes a molded Kydex sheath. Very similar to the OKC Military Machete listed above, the KA-BAR Grass Machete features a 14 inch, Straight Back, blade design but, instead of the usual 1/8 inch blade thickness, the Grass Machete features a full 1/4 inch thick blade made from 1085 high carbon Plain Tool Steel which makes it relatively heavy for such a short machete but, also very strong. In addition, it also features a straight, plain, cutting edge with a Duplex Grind and a highly ergonomic handle made from Thermo Plastic Rubber. Plus, it comes with a heavy duty nylon sheath. Designed by the famous, large knife, custom, bladesmith Jerry Hossom who based the design on the Greek Kopis sword, the Outdoor Edge Brush Demon is a heavy duty chopping tool that features a 13 1/2 inch Clip Point blade design with a recurved edge and an American Tanto Point made from 65 Mn high carbon Plain Tool Steel with a black, powder coat finish to help prevent corrosion. In addition, it also features a very ergonomic handle design made from Thermo Plastic Rubber for a secure and comfortable grip and, it includes a heavy duty nylon sheath. So, as you can see, there is a very wide range of modern machetes on the market today ranging from light duty to extra heavy duty cutting tools with a wide range of variation in both blade lengths and blade designs. Now you know the basics to choose the best machete for your specific needs. When choosing a machete, it is very important that you take the time to carefully consider how you intend to use your machete so that you can choose one with the proper blade design as well as the correct blade length and blade thickness. The tool that you choose will hopefully meet with your expectations and perform the job that you intend for it to with relative ease.